The all-new PEUGEOT Rifter has been named best MPV at the UK Car of the Year Awards 2019. As top MPV, the all-new PEUGEOT Rifter will now go up against other category winners for the overall UK Car of the Year award. 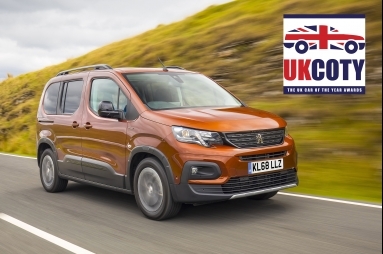 The ‘Best MPV’ prize at the UK Car of the Year Awards follows victory for the all-new PEUGEOT Rifter at the 2019 Company Car Today CCT100 Awards, in January, where the model was also named ‘MPV of the Year’. Launched in 2018, the all-new PEUGEOT Rifter offers style and practicality in the MPV sector, taking design cues from PEUGEOT’s multi-award-winning SUV range. The all-new Rifter also comes with PEUGEOT’s innovative i-Cockpit®, outstanding modular interior layout and impressive carrying capacity. The Standard version is available with 5-seat configuration, whilst the Long version is available in 7-seat configuration. The all-new PEUGEOT Rifter shone above the competition, against models including the Volkswagen Tiguan Allspace, to be named MPV of the Year 2019. Designed to showcase and advise drivers on the best new cars on the market, the UK Car of the Year Awards are deliberated by a panel of 29 leading automotive journalists across the UK, including experts from Top Gear, Car and The Daily Telegraph. Each judge selects their top performer from 12 vehicle categories, before deciding the overall winner from their favourites in each class. Testing for all category winners going head to head for the top UK Car of the Year Award 2019 will take place on Tuesday 12th February at Caffeine & Machine in Stratford-upon-Avon, with the winner announced on Friday 1st March.